Lung cancer is considered the leading cause of cancer death worldwide, despite a steady decline in the mortality rate resulting from widespread public health awareness campaigns. New advances in lung cancer treatment approaches, as well as immunotherapy and targeted therapies, are essential in treating patients with advanced stage disease. According to Dr. John Heymach, chairman of Thoracic Oncology at MD Anderson, approximately 160,000 people die from lung cancer every year, a number more significant than the next three prominent cancers (colorectal, breast, prostate) combined. 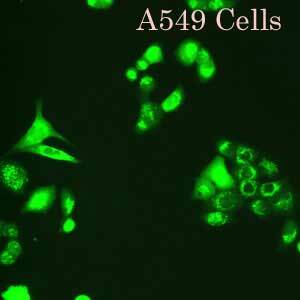 The A549 lung cancer cell line has been used to investigate treatments for various forms of lung cancer, in addition to other respiratory illnesses such as asthma. 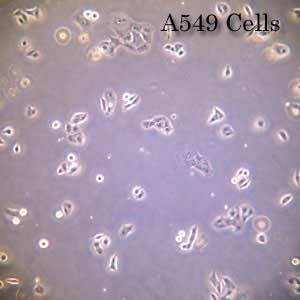 The A549 cell line was derived in 1972 from the carcinomatous lung tissue of a 58-year-old Caucasian male. A549 cells are adenocarcinomic human alveolar basal epithelial cells that are squamous and responsible for the diffusion of substances such as water and electrolytes, across the alveoli of lungs. This cell line a hypotriploid human cell line with the modal chromosome number of 66, occurring in 24 percent of cells. There were also frequent instances of cells with 64, 65, and 67 chromosome counts. A549 cells have been shown to synthesize lecithin with a high percentage of desaturated fatty acids via the cytidine diphosphocholine pathway. These cells are used in vitro model for a type II pulmonary epithelial cell model for drug metabolism. Immunoperoxidase staining shows that A549 cells are positive for keratin. This cell line is typically used to investigate numerous respiratory ailments, such as viral infections that can cause asthma, tissue damage linked to asbestos exposure, and smoking-related emphysema. A549 cells grow as a monolayer and are capable of synthesizing lecithin. Altogen Biosystems provides cell type specific and preoptimized transfection products, elecroporation kits, and targeted in vivo delivery reagents. Advanced formulation of reagents and optimized transfection protocols provide efficient intracellular delivery of protein, DNA, mRNA, shRNA, siRNA and other biomolecules. 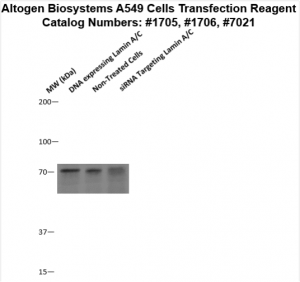 Read more about transfection technology at Altogen’s Transfection Resource.